Experience a holistic approach to releasing stress and anxiety in this 2 hour Sound Bath Immersion. Through integrated breath work, gentle yoga, guided meditation, reiki, aromatherapy, and the magical vibrations of the 7 chakra aligned crystal singing bowls, you’ll be supported and nurtured through the process of self-healing. You’ll practice breathing techniques to calm the sympathetic nervous system, eliciting the relaxation response. You’ll open your body to releasing muscle tension through gentle flowing movement and Yin style yoga postures. 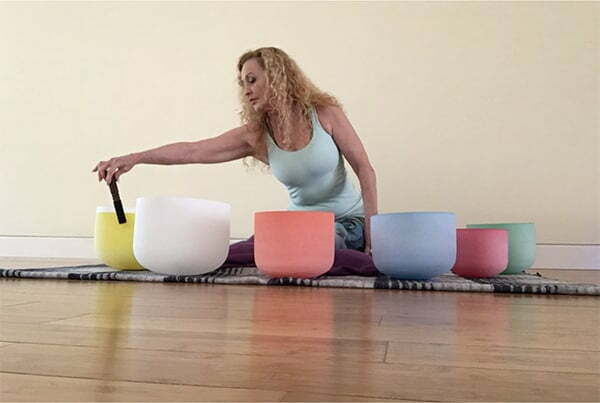 You’ll rest in Savasana with a guided meditation, then experience the soothing sound of the crystal bowls to bring you into a deep state of relaxation and emotional release (sometimes called Yoga Nidra). Give yourself the gift of self-care. Rejuvenate and realign, mind, body, and spirit. Saturday September 29th, 4-6pm. Limited space, to allow for personal attention. $35 paid in advance. $40 walk in, if space available.